Though the business has changed ownership several times, the snack shack at Boettcher Park has operated for more than 20 years. 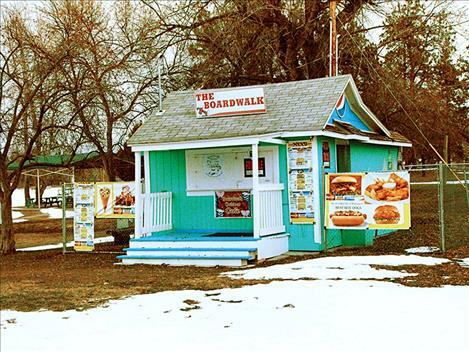 City officials have decided not to renew the lease agreement for the Boardwalk Café. 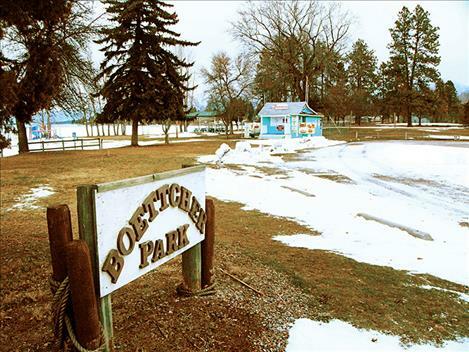 POLSON — The future of a historic Polson business is in limbo after city officials recently decided not to renew a lease for the Boardwalk Cafe at Boettcher Park. Business owner Tiecha Broussard says city officials were unwilling to meet with her last September and in mid-December after City Parks Director Pat Nowlen notified her in a Sept. 19 phone call that the city would be looking at charging her a fee or not renewing her one-year lease. Broussard’s leases included services that she was to provide to the city in lieu of not being charged a fee. The city says the business was lacking in performing these duties, which were to amount to 110 hours a year, but Broussard maintains that she went above and beyond by providing services not listed in the lease and that city officials never met with her to discuss any supposed deficiencies. Broussard says she was notified on Jan. 4 by City Manager Mark Shrives that the city would not be renewing her lease and was given until April 1 to remove her building and any improvements. She also maintains that the last lease expired May 18, 2016 and that she had operated without a lease during the last two years, which Shrives confirmed. She says that Nowlen informed her in early January that the lease was no longer up for consideration, but that she could meet with city officials. She said she was told her lease was not being renewed because of liability concerns and because she wasn’t paying a fee. She presented evidence of a $1 million liability insurance policy with Farm Bureau and notes that her location wasn’t free because she performed services in-lieu-of payment. Nowlen said he contacted Broussard on Jan. 9 in an attempt to set up a meeting between her, himself and Shrives but she refused to meet and instead requested to have the issue put on the city commission’s agenda. Broussard said Shrives called her for the first time on Jan. 9 and that he informed her that she would have to meet with him before he placed her item on the city commission’s agenda. She provided a copy of a Jan. 10 email from Mayor Paul Briney in which he told her that she needed to fill out a form in order to be placed on the city commission’s agenda. She said she never filled out the form because Shrives told her in the Jan. 9 phone call that he would have to approve of placing her item on the agenda and she believed that meeting with him at that point would’ve been a waste of time. Last week, Shrives said that just because the city did not renew Broussard’s lease “doesn’t mean we can’t work through it.” He said the city may put the food service at Boettcher Park out for bids, adding that Broussard shouldn’t necessarily have an exclusive lease to the park. Broussard spoke during public comment at the beginning of the commission’s Jan. 17 meeting about her issue with the city. Boardwalk Cafe’s sales have increased from $17,000 to $50,000 yearly, she said. In a press release Shrives issued on Jan. 29, Nowlen said the city cannot control the work or make the concessionaire accountable in accord with the lease agreement because she is an independent contractor. “I know this may be a hardship for the concessionaire, but the city’s financial interest and the interest in the public for a safe, clean and engaging park is paramount … It is clear that the park must be managed for performance, quality, equality and equal opportunity,” Nowlen said. Nowlen lists three options including: bringing in a mobile concession vendor and charging them a fee per the city’s fee schedule; constructing a city-owned building to be leased to a vendor through a bid process; or constructing a building or mobile vending and staffing it with parks and golf restaurant staff. Shrives said he doesn’t have a specific fee amount in mind for a vendor because the city hasn’t gotten that far yet. He said that if Broussard wants her item to be put on the city commission’s agenda, she would need to fill out a form and discuss with him what the issues are so he knows what actions to be taken when he addresses the commission. As far as liability goes, Shrives said the city does have concern about it. He noted that a city-owned table in the park flipped after a man sat on it a couple of years go. The man, who was a customer of Boardwalk Cafe, filed a complaint, but Shrives said it didn’t go anywhere and that the city’s insurer never paid out for it. As far as the Boardwalk Cafe building goes, Shrives said the city owned it originally but that subsequent sales of the business reflect that the building was included. “I’m assuming it’s owned by her based on the bills of sale I’ve seen,” he said. Shrives said the park is currently closed for the season, but noted that Broussard would have to coordinate with the city if she wants to remove it. She noted that she spent thousands of dollars to upgrade the electric in the restaurant in 2016 to provide better service to her customers and said that involved the installation of a power pole and that benefited the park and the city. She said she is not interested in placing a bid to offer food service at the park. “You can’t move forward with someone you don’t trust,” she said, adding that she doesn’t trust Nowlen or Shrives. “I believe I’ve been treated unethically and unprofessionally,” she said. Broussard she plans to fill out the required form to try to get on an upcoming city commission agenda, although she said she realizes she missed the deadline for the Feb. 5 meeting. The cafe dates to more than 20 years ago, according to Nowlen, although Broussard said it dates back 50 years. She has owned and operated the business for the past five years after taking over from Wayne and Carolyn Zuehl, who operated it for six years. Dino and Joyce Combs ran the operation from 1998-2006, Nowlen said. Prior to that, the city had a concession agreement with Russel Grant, but Nowlen didn’t know when it commenced.